Once again, starting off with soup! I really liked this soup compared to the previous one I’ve had before. It was very Fall, and had hints of squash or pumpkin in it… was super good! 🙂 . 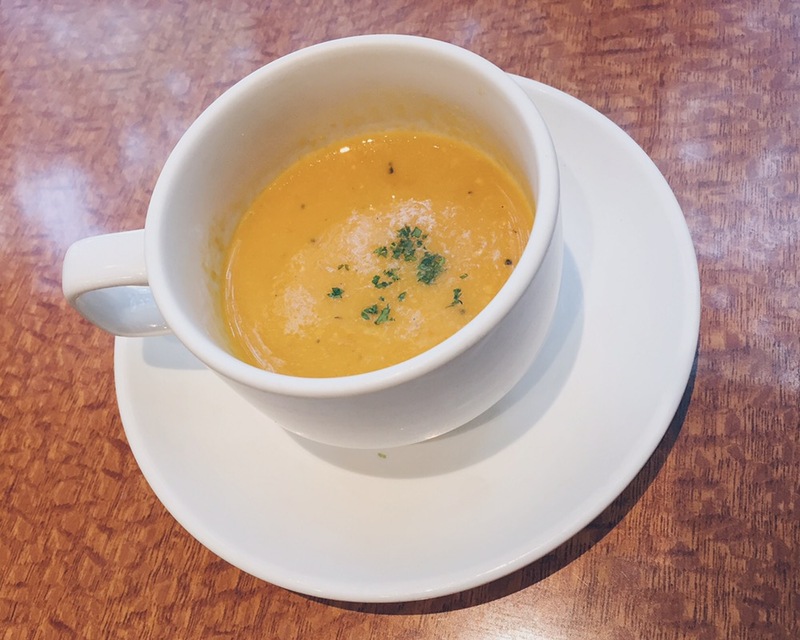 This time, I wish they gave unlimited refills of soup… It was too yummy! We decided to try different things off the menu! So L got the Smoked Salmon Cream Sauce pasta which had a light cream and dill sauce and pieces of salmon in it. The sauce was super creamy and lovely. The dill taste wasn’t too overpowering, since dill is pretty strong even with just a teaspoon. Even though I couldn’t smell the dill, I could taste it and I definitely liked the mix of this sauce. It almost looked like Carbonara sauce at first glance! 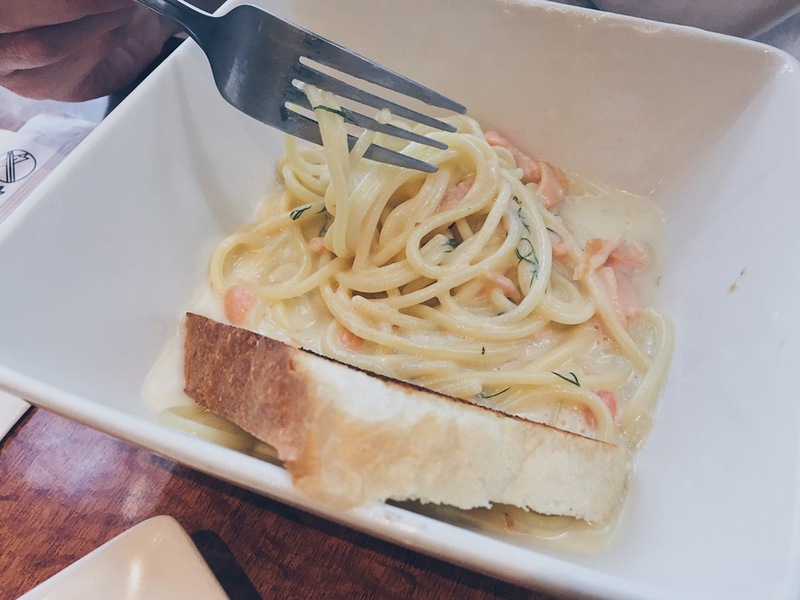 I got the Wafu Smoked Salmon pasta which had smoked salmon, mentsyu butter sauce and nori. I love nori on food because they just add one more to the presentation and I like the subtle taste of it with the pasta! This sauce was more of a watery sauce, so it’s similar to the Shoyu Mushroom pasta that I ordered previously. You can definitely taste the salmon in the sauce as well as the buttery flavour. The Wafu Smoked Salmon pasta is okay, but I much prefer the Shoyu Mushroom pasta. We definitely had to try another one of Shiso’s fries! 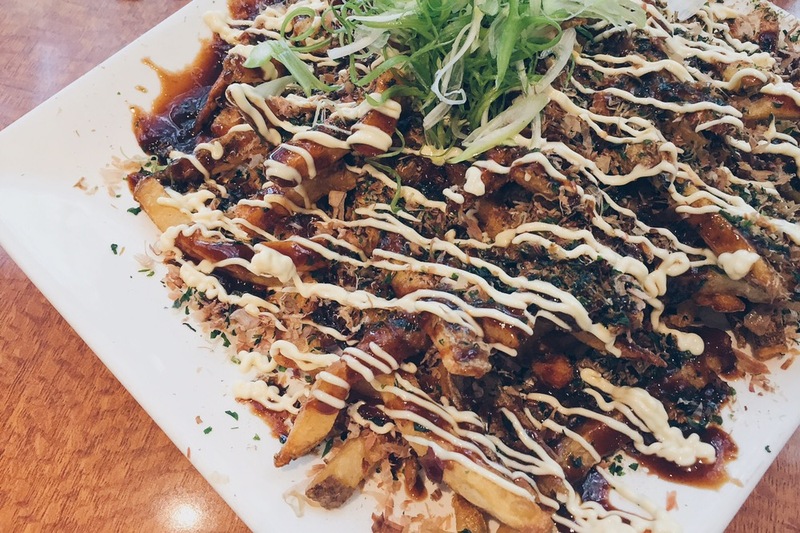 It was a tough choice between the Nori fries or the Okonomiyaki fries, but we ended up with the Okonomiyaki fries. The serving of the Okonomiyaki fries was in a hugeee plate and I was definitely surprised at how big it was compared to the Japanese Poutine. It was massive! But I understand why the plating was so huge, because it was made to replicate the Japanese pancake itself 🙂 ! Though because of the big serving and how hard it is to finish it all at once, when it gets cold, it didn’t taste as good anymore. Plus because of the many sauces, fries might get soggy as time goes on as well. 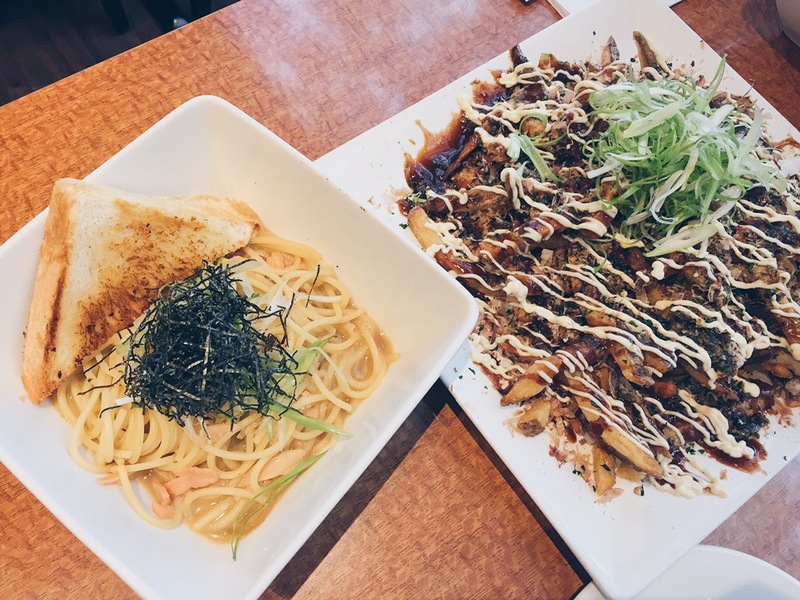 Despite some of the cons, I would still definitely recommend to share the Okonomiyaki fries with a friend or friends! 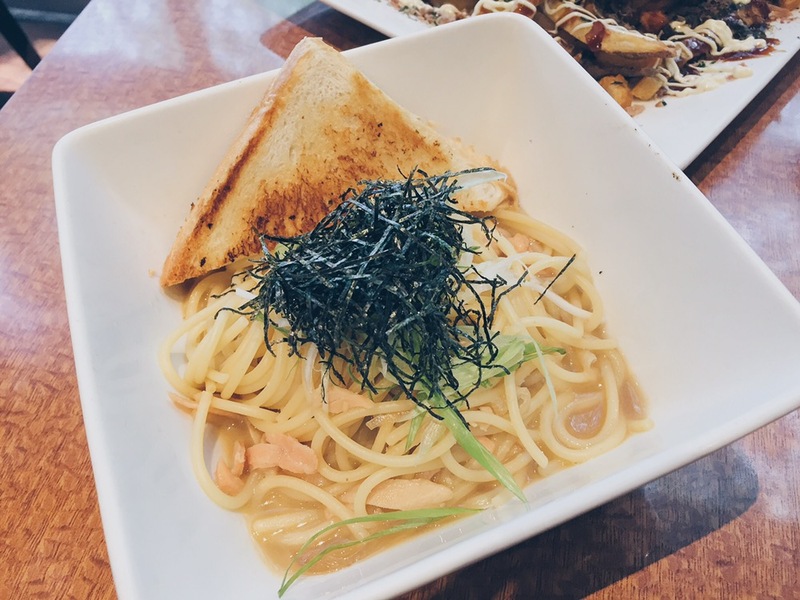 Once again, Shiso Tree Cafe did not disappoint! I would still recommend this place, especially for their lunch servings since it’s so cheap!